Ingrid Goes West, the latest and greatest from NEON, has arrived on Alamo Drafthouse screens this month. The biting black comedy sees Aubrey Plaza’s insecure and unhinged Ingrid Thorburn head to LA in search of a new start… er, sort of. Mostly she just wants to become IRL besties with her latest Insta obsession, Elizabeth Olsen’s Taylor Sloan. Sloan is the very epitome of LA boho chic, living the hyper curated life of a social media “influencer.” Food figures in prominently for both characters in the film — but their tastes are decidedly very different. We saw this movie earlier this month and absolutely loved it! 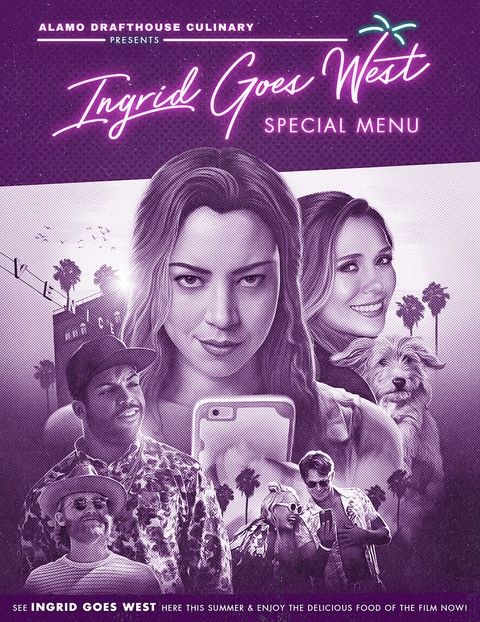 Now, you can experience both the Ingrid AND the Taylor sides of life for yourself with Alamo Drafthouse’s Ingrid Goes West Menu — a one-of-a-kind lineup of eats that’s essentially two menus in one. Grab a booth on the “Ingrid’s Diner” side and prepare to be comforted #bigtime. 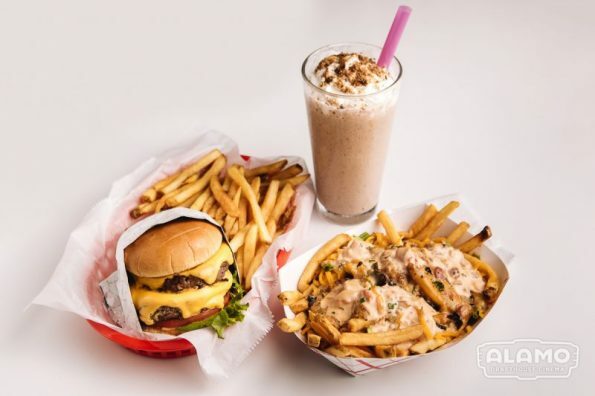 “Cali Fries” and the “Quadruple Double” pay homage the iconic West coast fast food Ingrid downs by the bagful in her life off-line. Covered in classic toppings and smothered in the aforementioned house-made Thousand Island, there is #zeroshame in loving these comfort food staples (bonus: the “Cali Fries” are veggie-friendly, too). There’s also no shame in pairing either with a #chocoholic’s dream, the “Triple Chocolate Shake” (1. Ghiradelli chocolate, 2. Oreo cookies, AND 3. Coco Puffs) for the ultimate comfort meal. Get yourself in a relaxed #CaliStateofMind with “Ingrid’s Coronarita” — a tiny bottle of Corona tipped into a big ‘ol frozen margarita.Or, for the #UltimateIngridExperience, pair it all with a tall pint of Ingrid ‘Gose’ West, a limited-edition German style beer infused with lime, salt, and tangerine. Brewed with the film in mind by our friends at Avery Brewing Co., it’s a #perfect summer sipper and available only while supplies last. 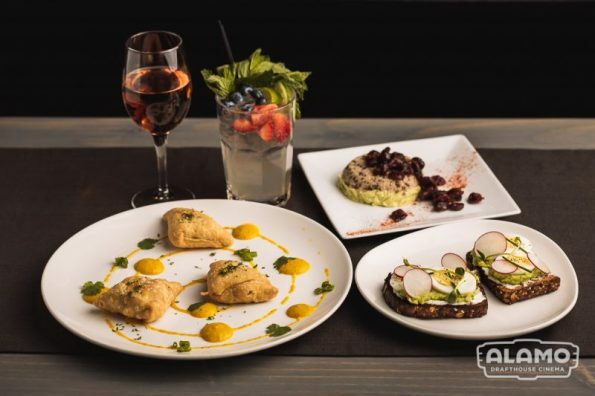 If Ingrid’s Diner isn’t your scene, no rezzies necessary, pull up a table at “Taylor’s Bistro” for a refined assortment Instagram-worthy vegetarian and vegan options (just resist that urge to actually pull out your phone and post, K? Thx.) “Avocado Toast” gets top billing, natch. “Cauliflower Samosas” — our vegan take on the classic Indian street snack — are a #perfect compliment for your avo toast or a mini-meal unto themselves. Served with a mango-serrano chutney for an extra touch of sweet heat. To complete your #foodgasm, dive into “Dessert D’or,” a decadent — and #vegan #glutenfree — sweet repast of avocado and cashew mousse atop a coconut crust. Finally, toast new friends and/or new followers with a cool and refreshing “Farmers Market Mule” (vodka and ginger beer with fresh berries, mint, and cucumber), or with a splash of “Squad Goals Rosé,” available by the glass or the bottle. The menu is available for a limited time so visit while you can!